I'm gonna wait on the resident expert on GT uniforms to check in before I commit. Mack, tell me what I think. Lex, I really like those. I like how he kept it simple, yet modern, kinda fusion of old and new. First post and its a uniform post, starting out on top lol...but yeah I really like those. Gotta love the white helmet!! Welcome aboard Ramblin Man. Uniform posts are inevitable, you may as well have it out of the way. My friend to each his own when it comes to unis but I like the new concept.No more stripes and slashes and stingers etc and if they did this a bunch of old guys would be happy.I didnt see any black socks either so its more uniform than the mess we wear now.Gosh a uniform that was voted best in the ACC in 90 under Ross and now is what 11th or 13th best looking in the modern ACC just doesnt cut it.Maybe one day they will humor me.Tell me my friend what you would like to see. Simply, and it won't happen because of Russell and modern day marketing, and maybe the players of today wanting to be splashy (well, they may think that stuff is, but it ain't) but get into the trunks and haul out the '50s stuff. I don't think it ever got better than that, and a school like GT ought to know the architectural rule: form follows function. As a fallback, at least some stuff that isn't plug ugly. Am I asking to much? Thanks for posting the links. 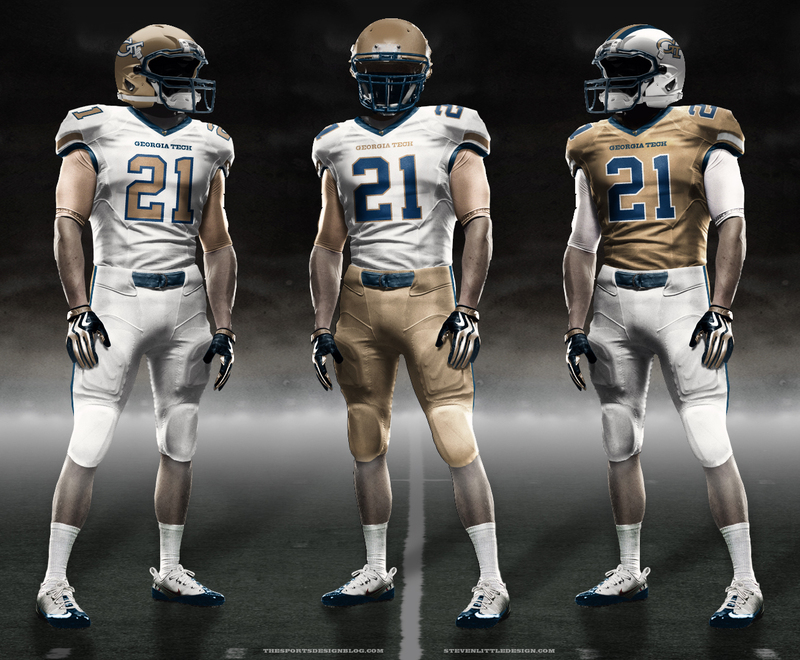 I like all of these uniform designs. Has Tech's athletic association or administration said anything about them? I have sent the link to Wayne Hogan along with my endorsement. I think I'll do it again and copy DRad. I still don't know who picks the styles at Tech, but I'm sure they do.